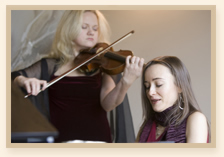 Joanna Korylczuk and Joanna Majka are full-time, professional musicians with Masters Degree’s in Music. Educated in Europe, they have received much exposure in Germany, Poland, Spain, Switzerland, Sweden, and Belgium, to name a few. They met in Chicago and were instantly inspired by each other’s tremendous passion for music. Through this duel inspiration, they have created a unique sound and exceptional, one-of-a-kind arrangements. Classical 2 blends contemporary and classical influences, creating imaginative renditions of popular classics, jazz standards and famous Broadway songs. With Classical 2 your next event will be unforgettable!